The word "mink" is used for the two sole species of these animals still residing on the planet. These semi-aquatic species are the American mink (Neovison vison) and the European mink (Mustela lutreola). Although both types of mink are undeniably similar animals, they have their fair share of individual qualities, too. American mink are usually deep brown or black in color, although they also feature white markings on their chests and on some other parts of their bodies. The smooth-furred creatures have short limbs, lithe physiques, tiny ears and lengthy necks. American mink generally weigh between 25 and 56 ounces, with lengths of 18 to 28 inches. European mink have similarly shaped physiques and coat coloration, including some of the white patches. They usually weigh in the range of 16 to 26 ounces. Male European mink are slightly longer than the females, with typical lengths of around 15 inches long. The typical length for female European mink is approximately 12 inches. American mink roam all over both Canada and the United States, although they are nonexistent in a handful of states and regions -- think Arizona and Hawaii. These nocturnal mammals usually inhabit woodsy forest areas, especially those that aren't far away from water sources, whether ponds, rivers, marshes or swamps. 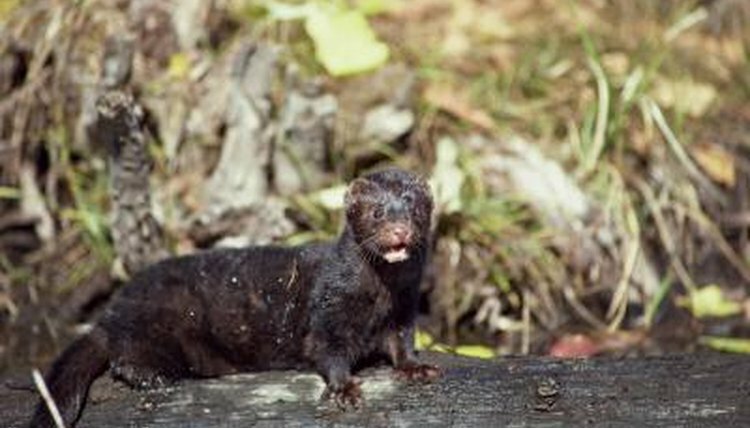 American mink often employ rocks and tree logs for denning purposes. European mink, true to their monikers, live all the way across the pond in nations such as Spain, France and Russia. They tend to live in the lands surrounding creeks and rivers, particularly if ample plants are available. It is common for European mink to set up camp inside of burrows previously established by muskrats. When mealtimes roll around, American mink are meat eaters, no two ways around it. Some of their preferred prey animals are rabbits, chipmunks, ducks, birds, snakes, mice, shrews, frogs, muskrats and fish. In times of cold weather, American mink are especially drawn to mammal consumption. They make a habit of acquiring more food than they are able to take in at once, and then stash away the remainder for another time. European mink are also carnivorous, and they are especially partial to animals that live in the water. European mink frequently feed on voles, muskrats, fish, frogs, crabs, moles, bugs, mollusks, shrews and birds. The reproductive season for American mink takes place during January, February, March and April each year. European mink typically mate in both February and March, similarly to their American friends. Female American mink gestational periods generally last for between 40 and 75 days, while the typical pregnancy time frame for European mink is roughly 54 days. Both species of mink are mostly solitary and independent creatures -- not social at all. They generally "fly solo" all throughout the year, apart from during times of mating. What Do Bullfrogs Do in the Winter? American Crocodiles Eat What Types of Foods?